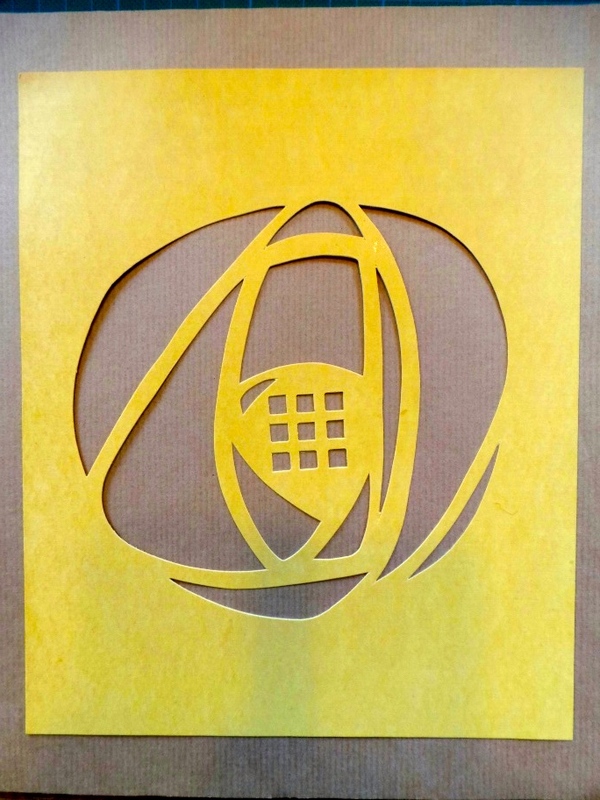 So basically take a design which you want to apply somewhere, trace it on a piece of card, cut it out and bang paint through the holes to make it appear… by some kind of magic.. I discovered this little text in a dusty painter’s and decorator’s guide about 25 years ago just as I was discovering Charles Rennie Mackintosh and I have never looked back. I have been stencilling ever since. Many different designs but I do love a Glasgow style rose and the stencilled ones are so very satisfying. 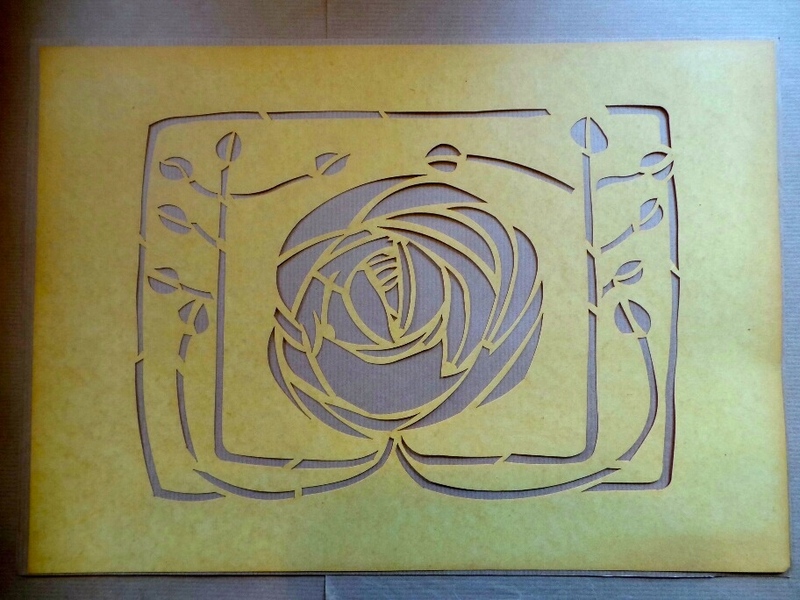 I began to stencil with the very Glasgow Rose many years ago, I was working for the Charles Rennie Mackintosh Society in the back office and though it was essential a Rose stencil was on the market when so many visitors were in search for one. My Glasgow Rose was very simple, a few petals with the famous squares in the centre, not too simple though as its design caught the eyes of many would be designers and it sold like oatcakes in Scotland. 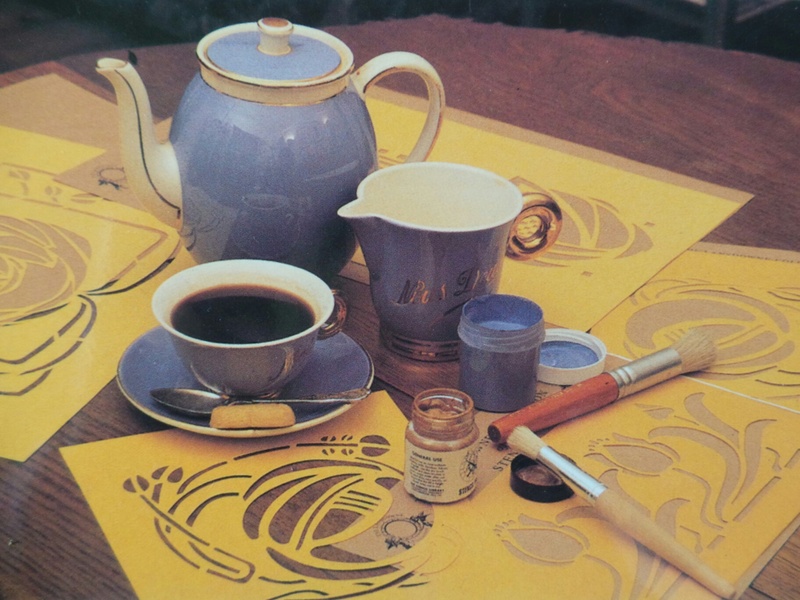 Many designs followed but no patterns brings back to me the nostalgia of those days as that very rose was first cut one evening on my kitchen table and would be the first step of my beautiful relationship with stencilling. Today I have a great range of Mackintosh stencils in my collection, small, large, for the beginner or the more advanced stenciller. 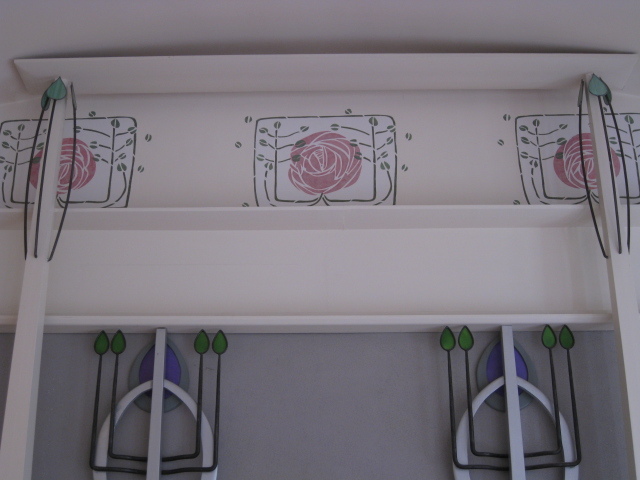 like the famous design I was commissioned for the music room of The House for an Art Lover one of unbuilt dream Mackintosh had which eventually was put together by a team of art lovers in the late eighties … and I was part of them. I like the idea that many can re-create a turn of the century scheme and for that reason I have made my collection of stencils public on Etsy (www.Etsy.com look for TheLansdowneHouse) and you can purchase any of those designs or even commission your own, they come with full instructions and are easy to use.